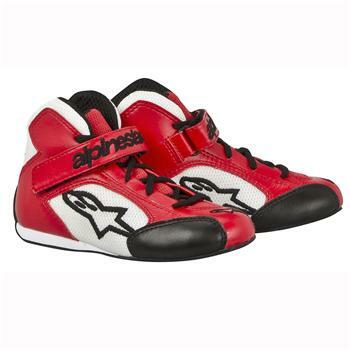 Alpinestars Karting Shoes - Tech 1-KS Youth UNIVERSAL - Dezod Motorsports Inc - Home of the automotive performance enthusiast since 2002. Durable, light and incorporating fashionable aggressive styling, the Tech 1-KS is specifically designed for the younger kart racer. A strong microfiber upper and 3D mesh inserts combine for excellent comfort, durability and ventilation, while Alpinestars advanced rubber compound sole and innovative heel counter offer excellent grip and feel. Designed and constructed especially for Youths and incorporating aggressive styling. Light and durable advanced microfiber and mesh construction offers excellent comfort and feel. 3D mesh inserts on the tongue and perforated microfiber panels on the heel and sides offer excellent ventilation. Padded sole incorporates Alpinestars exclusive rubber compound for improved pedal sensitivity and grip in all conditions. Innovative heel counter and lateral forefoot structure offers support and stability. Durable lace closure system and Velcro strap offers safe and secure fitting.